THE YEARLY ATONEMENT WARRIORS FESTIVAL OF THE "ADA-ASAFO"
Asafotufiam: The yearly atonement warriors festival of the Ada-Asafo. The name "Asafo-tu-fiam" consisted of three word name components. The 1st. component name is "Asa"; which is the plural of "Sa"; a noun. When the spiritual title "Sa" become as a member title "Asafo", it turned to be an adjective, which means ; An Ordained member of "Osa" Spiritual Doctrine. "Osa" is the singular of "Asa". The original name "Sa", which sometimes called "Osa", "Asa" or "Aesir", actually means ; The Spirit Body of the Supreme Divine Creator of the Universe. This title was used during the Ancient time, for a Human Figure of the Supreme Divine Creator of the Universe. The name "Osa" or "Asa" is what the Greek has corrupted to as "Osiris". "Osa" was a Black Nubian man who was once worshipped strongly in the world, include Europe, He was one of the Holy Ancestral Divinities of the 'Ada-people", just like all black people and all black Nubian Nations in the world today. The "Divinity-Osa" who was the husband and brother of the once most powerful Woman and a Black-Woman (Nubian) Queen ever lived on this earth. 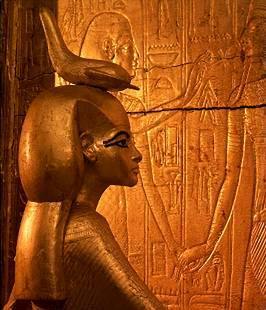 She was the "Divinity-Asasi" (Asasi-Afai) sometimes called "Asi" or "Essie" and known to the outside world by the Greek phonetic spelling as "Isis". The 2nd. component word name of "Asafo-tu-fiam" is "Tu". "Tu" is the name literally given to a "gun" or a "pistol" in the Ga-Adangbe language. Authentically, the name "Tu" is a synonym of "Tutu", which means "Spiritual Body Soul". 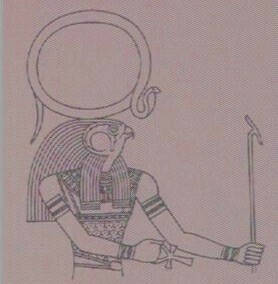 The name "Tu" or 'Tutu" was the Divinity name of the Conductor and the Brain Faculty of the Ancient Nubians "Osa" Spiritual Doctrine. The full name of "Tu" or "Tutu" was "Tutu-Ani", sometimes known in some history books as the scribe "Ani". The Ga-Adangbes named "Tu" after a gun or a pistol, philosophically, it meant ; Physical-Spiritual weapon of the Tutu spiritual body soul, the Ancestral Divinity spiritual name was used spiritually, during their many wars as a spiritual war defender or fighter. The 3rd. component name of "Asafo-tu-fiam" is "Fia" or ("Fiam" as a slang), meaning ; Slap, by means to Shoot, Shot at, or Shooting. "Tu-fia" or "Tufiam" literally mean ; slapping an object by means of gun shooting. Therefore, the full meaning of the name "Asafotufia" or "Asafotufiam" is that ; The Ordained Osa Spiritual Doctrine practitioners gun shootings. Philosophically, the evokes of the ordained "Divinity Osa" Spiritual Doctrine warriors. 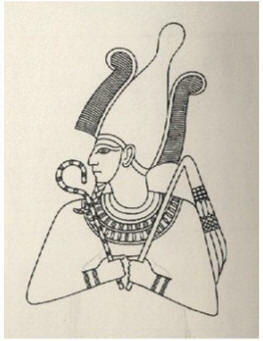 THE ANCIENT NUBIAN DIVINITY "OSA" OR "MENSA", WHOM THE GREEK CALLED "OSIRIS". HE WAS THE ANCIENT HUMAN KNOWN THEN AS THE HUMAN GOD SYMBOL. "Osa" or "Asa" Doctrine, is an Ancient Nubian Ancestral Holy Spiritualism, which was practiced by our Ancestors and still being practice by their descendants. "Osa" Spiritual Doctrine practices was the mother of all spirituals and religion practices in "Nubai" ;- now called "Africa", specifically, practiced in the North East Africa and the Middle East mainly, include Europe. This Ancient Ancestral Nubian practices became a legacy for their descendants, include the Dangme "Ada", a sub-nation of the Ga-Adanbges (Ga-Dangmes), Ghana. During the dispersion of the Ancestral Nubian Nations from the then Nubia, most of the relative nations scattered into transitions settlements to their present locations. The dispersion and the settlements were not peaceful, there was a disagreement among them which sparked war. The disagreement was due to "Queen "Aka-Asi-Amon" of Nubia (Egypt and territories) who broke the Nubians Original Royal Ruling method, after King "Tutu-Aka-Amon" death. "Tutu-Aka-Amon" was a cousin and a husband of Queen "Aka-Asi-Amon", the daughter of "Amon-hotep-IV" also known as "Akenaten". As one of the Nubian Sudanese from the North East Africa, the Ada-Asafo, also formally of the Yuroba Nation, settled at the south east part of the "Shwilao-river" delta, a shore area of Ghana. The "Ada Asafotufiam" festival originated in 1937 from the present Shwilao river delta vast areas, but their being of "Osa's" followers as "Asafo" originated before their dispersion from the then Nubian plains of Sudan Chad territories approximately 1,300 B.C. . "Ada" is an old soul, the past of the present and the resurrection of them to the present "Äda" locations was led by their warrior, a hunter and a spiritual leader the "Eagle", specifically known as "Korley". "Ada" poses to be of a two main cities (1) "Big-Ada" and (2) "Ada-Foah", however, in addition Ada consist of many villages within their geographical sovereign land. Big Ada is the root city and their spiritual cultural central for all their sovereign lands. While the historical Ada-Foah was one time one of the west African trading centers, it was active in oversea trading. Earlier, Ada delta served as a port for Export and Import trading before and during the Gold-Coast regime ; The exportations of most Ghana's raw materials and importation of European goods. The delta also influenced a variety of different trading activities ; The "Shwilao"-"DZO" Delta was also abused by practices of worst humanity humiliations ;- The enslavements of Nubians through the Shwilao river now the (volta-river) route to the delta, shortly after, the Shwiloa delta of "Ada" and "Anyagui" became the gate way for the European mercenaries, slave-traders, missionaries of the unknown, gold hunters, diamond hunters, swashbucklers (pirates), land and human Colonial mongers and any other activities without morals within the region, etc. The East and West coastal shores of the "Shwilao" (volta-river) delta was turned into a slave harboring dungeon stations. The Danish built a dungeon at Ada in 1784 and was named "Kongensteen", another dungeon was also built by the Danish at "Keta" in 1784 and was named Fort-Prindsenteen (Princedenteen) while in 1735 through 1741 another coastal Dungeon was built by the same Danish at Ningo (Nungo) also a territory of the Ada-Asafo. 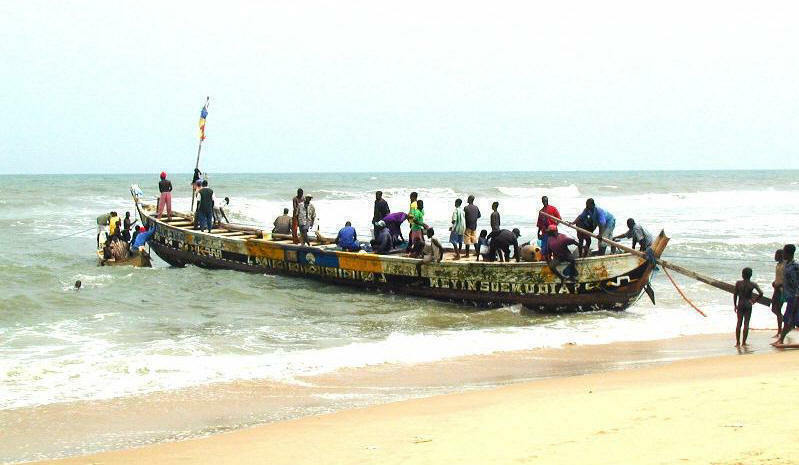 This inhumane terroristics territorial invasion activities by the Europeans clouded the Keta and Ada territories with intermittent war activities between the then mini-towns of the Dangmes and the European-colonial group-soldiers. BELOW : PART AREA OF THE "DZO" RIVER DELTA AT AZIZANYA ADA-FOAH . PICTURE TAKEN SEPTEMBER 6th.2007 by NII NAI-TETE. Mid May 2004, I visited Ada-Foah, and the first place where my foot stepped on the ground was "Fiegbedu" ; An ancient traveling stop over and a place to drink a natural well water to quench a thirst. Fiegbedu is approximately 700 feet walk to my Ada-Foah Ancestral home, the house of the "Pekus" and the link to "Mowenukpo"; my great grant mother of my mother side, who was also known as "Otuko-Nye"; the mother of "Otuko''. I started walking towards the Ancestral house and as I reached inside the house, the house was empty, frankly, I was provoked, yet the house was filled with the Ancestral spirits within the atmosphere. Momentarily, I was welcome with dazzling drizzling rain. As I am always passionately inclined with our Ancient Ancestral Spiritual Culture, I started Libation prayers with water, then I tour the house and the neighborhood, it was a feelings of personal reward and feelings of being in an Ancestral environment. BELOW : THE ANCIENT FAMOUS NATURAL WELL WATER AT FIEGBEDU, ADA-FOAH. PICTURE TAKEN SEPT. 6, 2007 BY NII NAI-TETE. The people of Ada authentically are one of the blood descendant of the Ancient Nubian of Sudan, their specialties are fishing, agriculture, animal-husbandry and salt excavation. As one of my cultured uncle explained the exodus of Ada-Asafo people and their "Asaotufiam" :- Uncle Amonortey Akpey, also known as "MOSES", who carries his Ancestral name "Amon-nor-tey", meaning; "This is Amon the eldest", now phonetically "Ama-nor-tey". Amonortey is synonym of Amanortey, an Ancestral name of "Amon-hotep-I", "Amon-hotep-II", "Amon-hotep-III and "Amon-hotep-IV" who was also known as "Akenaten-I", not to forget their relatives the Ammonites. Presently, many churches such as the Catholics Christian churches uses the synonym "Amon" of "Amen" after their prayers for affirmative to their prayers. 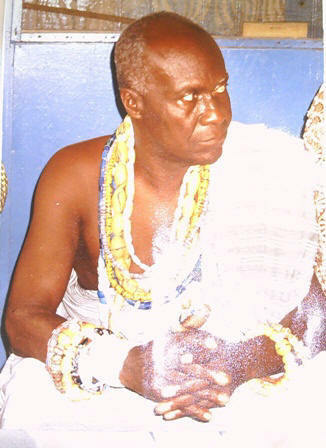 On the Seventieth year of the Ada Asafotufiam festival, uncle Moses also known as Amonortey-Akpey became a royal figure of the Ada people, Amonortey Akpey was enthrone a Royal head to one of the royal clans known as "Tekpe-bia-we", the clan of Korley the eagle whom the Ada "songor" was introduced to as the care taker authority to the Ada (songor) = salt excavation. The royal title of Amonortey Akpey is Nene Korley IV, the resurrection of the ancestral Korley the Eagle has been re-established again with the spiritual support from their divinity "Thunder". Nene-Korley IV of Tekpebia-weh Ada. The people of Ada are packed with Ancestral Ancient names such as "Otu", "Amon-ku" (Ama-ku), "Kuku" or (Kuku-yoo), "Otuko", "Kabu", "Kabuki", "Korley" "Korleki", "Otutey", "Mensah", "Tettey", "Tetteh" and "Abusaki", meaning ;- This is the judgment of "Osa's" Doctrine. In essence the Ada people include the "Ga-ADANGBES" carries the spiritual name "Osa" in the name of the "Osa's" Doctrine which they don't use loosely, instead they use the "Osa" synonym which is "Mensah". Ada, a part member of the Ancient Nubians, who was once with many powerful city states, is now among the newly formed "Ga-Adangbe Nation". Ada culturally and spiritually still practice their Ancestral Ancient theocracy within their believed in Monotheism. The theocracy monotheism doctrine of the Ga-Adangbe's Ada-Asafo has always been through their once trinity and redeemer ancestral Divinity "Osa". The "Asafo" warriors of Ada, a member of the Ga-Adangbes settled with their warrior leader by the name ; Korley;- which means "Eagle". After a few years of their settlement at the Shwilao-river delta areas, the warrior leader Korley will travel for days and weeks to east, north and west within 70-miles radius approximately to Ada related city states. Korley, also known as the Hunter was always with few of his soldiers. His hunting was also part of a territorial watch for new and unauthorized settlements of enemies or friendly relatives. His strategy to protect Ada territories was one of the ancient war strategies type; war watch stations, closer to Ada land boarders. Later, those war stations became known as villages, and later on those villages became towns like "Akuse", "Dawenya", "Gbugbla", "Old-Ningo", "New-Ningo" and "Sege" etc. Most of the once war watch stations that are now mini towns or villages still carries the war divinities in the name of the Ada "Osa" doctrine. 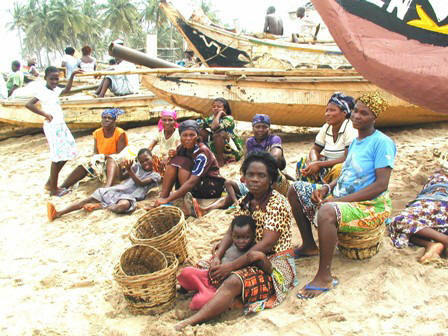 WOMEN OF SEGE VILLAGE BY THE SEA, AN ADA TERRITORY 2005, GHANA. Korley territorial protection activities produced a priceless gift to the Ada-Asafo people. One day when Korley was hunting in the territories, he shot at "Wuo", a (Nubian-Buffalo) now called "African-Buffalo", to be used as food for families. The Buffalo ran into the deep forest, Korley followed the blood drops of the Buffalo to a hidden village, he then entered the village of mostly women, he gently asked the village women if any wounded Buffalo came into their village, and that he followed the blood drops of the Buffalo that he shot at not long ago. As the villagers gathered around Korley conversing about the Buffalo, with a sudden quietness a path was gently opened and a distinguished royal old healthy looking woman walked slowly towards Korley from the back of the gathering. Before Korley the hunter and the warrior will open his mouth to speak, the old woman said to Korley; it was me whom you shot at as a Buffalo and these are the wounds from your gun. The old woman name given to me was "Libiwono", popularly known as "Yomor". Yomor welcome Korley to her village and praised him as a good man, for having the passion for humanity and to traveled that far just hunting for food to his family. The welcome of Korley, traditionally came with food and fruitful conversation with the old woman "Yomo-or". Yomor asked Korley to protect her people and her village and if he can do that, she will give him something priceless, Korley accepted "Yomor" request out of instincts and respect. In exchanged "Yomo-or" gave part of the "material soul of the Shwilao river" Ada area to Korley as a gift, which was the "Song-or" ; the salt of the Shwilao-river Ada area, to protect for the future generation of the Ada people. Shwilao is the now so-called the volta-river. Korley embraced the old woman's village as part of Ada under Ada protection. The name of the village of the old woman is known as "Lufenya" . All these periods the Ada-Asafotufiam was not introduced, due to the uncertainty of any attack from an enemy. 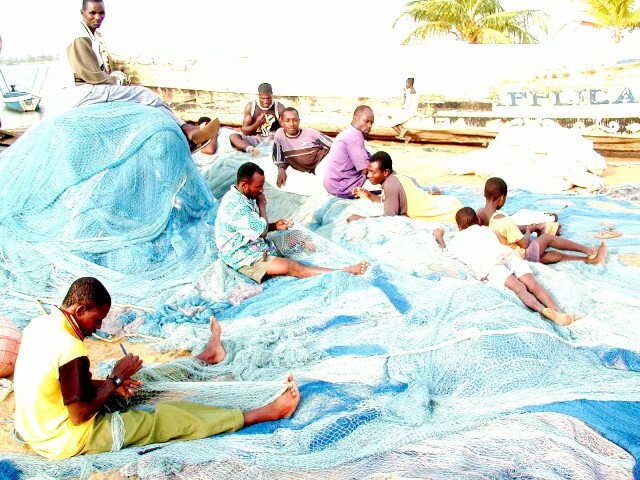 BELOW : AZIZANYA, A PRESERVED NATURE FORMED VILLAGE OF MINI ISLANDS OF ADA-FOAH. PICTURE TAKEN SEPTEMBER 6th.2007 by NII NAI-TETE. BELOW: PART OF AZIZANYA MINI-ISLANDS, ADA-FOAH. PICTURE TAKEN SEPTEMBER 6th.2007 by NII NAI-TETE. Consequently, all the sub-war stations of Ada geographical boarders include the Ada neighbors assured security of their new found land. In 1937, the elders of Ada-Asafo selected the month "Gbo" (August / September) of the Ga-Adangbes as their period to celebrate what is now called "Asafotufiam"; The festival of atonement, thanksgiving and celebration in the name of "Osa", to honor and in remembrance of years of wars, intermittent settlements and relocations that caused lives of their elderly, children, ancestors and love ones. Their wars was fought by their Asafo warriors in the name of the "Divinity-Osa". Ada is not different from other nations who once believed and still believe in "Osa" spiritualism. "Osa" spiritualism is as simple as playing part of the Asafotufiam festival, Homowo festival, Kpo-dziemo ceremony (Sanctification ceremony) and the ancient daily greetings of the Ada people, which has been part of their Asafotufiam festival. Their greetings are the most artistically cultured of a descent spiritual greetings I have ever witnessed. At last, just being an Ada makes them mandatory to be part of the ceremony, with or without their present at the ceremony of Asafotufiam. This no choice situation is due to the spiritual action being taken from each head house and from each clan, in the name of "Oas's" Doctrine for every generation of Ada, by means of libation. The "Sesa" and the "Sebi" or the "Angoor" and the "Angoor-hi", not to forget "Agbo-lo" and the "Eee-agbo" and the last but list "Onger-ayi baa oooo!. These are few of Ada greetings. These type of greetings evokes the true spirit of them with passion, due to the true spiritual language of the greetings being spoken of. Ada format is like other Ga-Adangbe sub-nations format, there are clans, clan houses and clan names coupled with divinities for each house and for each clan. During the preparations of the Asafotufiam festival, each divinity of each house performs it prayers of libation and cook for the house in the name of "Osa", because all the houses and the clans are Asafo Spiritual believers. Days before the Asafotufiam festival, all old guns are brought out from their rooms for cleaning and spiritual cleansing. Then during the main Asafotufiam festival, the guns will be fired into the air, to capture that historical spiritual atmosphere, as a symbolism and to evoke the Ancestral warriors respectfully. Asafo songs will be sang, children of Ada will go to Ada to witness and to show their appreciation to the Ancestral Asafo warriors, who fought for their being today and their children, while their Ancestors will appreciate their remembrance. During this event, new generation of Ada will get to know each other and the elders will get to know their generation. This in return, their Ancestors will bless them unconditionally as a legacy, by means of monotheism. Before the festival ends, most of the children of the Ada-Asafo wishes from the Asafo-tufiam festival is to be blessed with a husband or a wife, in this spiritual practical sense, the yearly festival month also become a marriage vows for most people. A perfect moment for the elders and the spiritual ancestors to meet the new warriors and the stability of Ada-Asafo. The power of love has always been unpredictable, this love section of self moral obligation during the festival is not an advantage, it is a spiritual act of wives meeting their husbands after years of wars and young men taking new wives after a long term war. The Ada Asafo-tufiam festival month "Gbo" (August-September) is the perfect month, the month of the end and the beginning of the year for the Ga-Adangbes, it is the month of harvesting and it is the month when ancestors visit their generation. This spiritual gesture is similar to the homowo festival portion of their sister sub-nation La-Asafo, whereby;- THE INDIVIDUAL GA-ADAGBE DEMONSTRATES A SYMBOL OF PASSION DURING THE “HOMOWO” FESTIVAL KNOWN AS “SHAKAMO”, WHEREBY A MALE AND A FEMALE WILL GENTLY AND RESPECTFULLY HUG EACH OTHER WITH SPIRITUAL PASSION INTENT PORTRAYING THE IMPREGNATION ACT UPON THE WOMAN. THIS SYMBOLIZES THEIR PARTICIPATION IN WITNESSING THE RIVER “NAI” DIVINITY IMPREGNATING THE GROUND DIVINITY “AFI” TO A FERTILITY OF PRODUCTION. 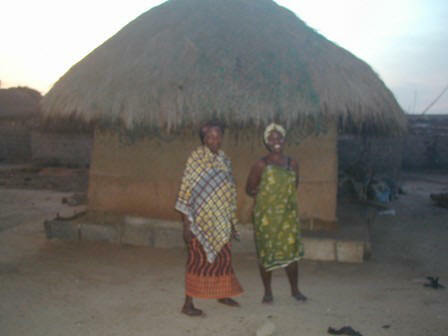 Most of the Ada-Asafo people are made of close relative family by marriage, a legacy from "Osa" the brother and husband of "Asasi"(Asasi-Afia) in a short form as "Asi" or "Essie". "Osa" who is also address as "Asa" to "Asa-fo";- who is a member of his spiritual doctrine, his name was uniquely honored to the festival as "Asafo-tufiam". The Ada Asafo-tufiam atonement spiritual-cultural festival is a unique legacy that is now facing an outside religious influence, the festival doctrine process does not require any foreign believe as part of the festival's spiritual component, such as going to church to justify the festival, instead of each going to their clan houses to receive a blessing and to be known by their elders and their spiritual ancestors as a honor of respect and thanksgiving to the festival. The Ada-Asafo, a sub-nation of the Ga-Adangbe Nation DO believe in the Supreme Divine creator of the Universe by means of Monotheism. In essence, the Ga-Adangbes DO NOT mixed their spiritual doctrines and festivals with any foreign spiritual activities on the same day of their spiritual festivals. ( GLOBAL NETWORK ICON ) COPYRIGHT . 2016 ALL RIGHTS RESERVED.